Taking a break from real estate in Broward County, I wanted to feature a great article that Gold Coast Magazine just posted on their site in the Fort Lauderdale Daily. As we know, Broward County has some of the best restaurants and bars in Florida, but Gold Coast went further and asked their readers to vote in more categories. One year long poll collected more than 2500 votes. I’m also including some links for Broward County homes and condos, Fort Lauderdale Real Estate, Fort Lauderdale waterfront homes and non-waterfront homes and condos below. please see their article. Addresses for the businesses are on their website. The Best of Broward County: Restaurants, Bars, Gyms and More. Dale Palmer completed training and was approved as a USAA Real Estate Rewards Network agent. USAA is the organization that handles a large part of the rewards benefits of the US military and real estate purchasing, selling and renting of property is one of them. Top agents are selected from their offices by their broker and given the opportunity to go through the training and approval to work with the US military personal for relocations via the USAA network. I’m really excited to be approved for these types of relocations. Providing the US military personal with real estate services is a real honor. Dale Palmer & Associates would like to announce the dates for the 58th annual 2017 international boat show in Fort Lauderdale, Florida. The boat show will be held from November 1st – 5th, Wednesday through Sunday. ‘Over the past 57 years the Fort Lauderdale International Boat Show has evolved from a local boat show into a truly international exhibition,” MIASF CEO and president Phil Purcell said. Owned and presented by MIASF, the Marine Industries Association of South Florida. Fort Lauderdale International Boat Show, please see their website. 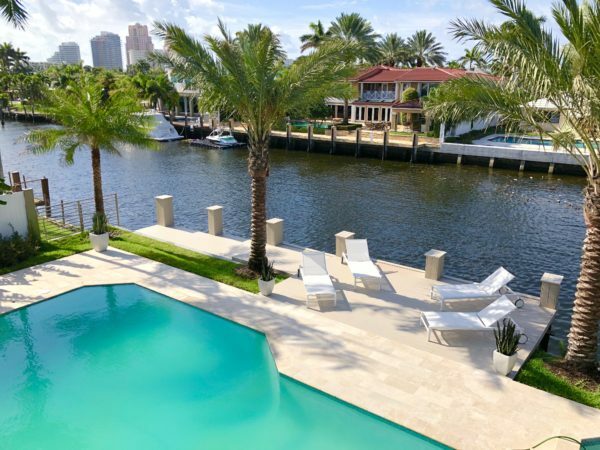 The city of Fort Lauderdale is known as the “Yachting capital of the world” and as the Venice of the United States with all the inland waterways and easy access to the Atlantic Ocean via the Intracoastal waterway. Fort Lauderdale waterfront homes have a wide range of prices for the type of access and size of your boat or yacht. I’m including some popular links for waterfront homes, homes with over 150ft on the water for your yacht and direct Intracoastal front homes. Dale Palmer & Associates would like to congratulate Tom and Paul on the sale of their beautiful home in Oakland Park. Thank you very much for using us in the selling of your Oakland Park Home. Royal Palm Acres is located in the western area of the city of Oakland Park, just north of Oakland Park Blvd and west of I-95 off NW 21st Ave. Royal Palm Acres is a popular area with more affordable dry and waterfront homes with easy access to downtown Wilton Manors and not far from the beach. This beautiful pool home had 3 bedrooms, 2 bath with a gorgeous landscaped back yard, 1 car garage, solar heating for the pool, updated kitchen with new black stainless appliances. The redevelopment plans for the almost desolate Las Olas Riverfront site in downtown Fort Lauderdale have been revealed. Built in 1998, Las Olas Riverfront was a popular restaurant and entertainment destination for many years, but it got hit hard by the recession, lost many tenants and fell into foreclosure. Dev Motwani, acquired the 3.67-acre property out of foreclosure for $16.7 million in 2011. The Fort Lauderdale Riverfront retail complex is mostly vacant now. Motwani has been seeking development partners for the property and he’s found a big one. Ryan Shear has a pending deal to acquire the 2.38-acre western portion of Las Olas Riverfront from Motwani’s company. That’s the area closer to the train tracks with frontage on the river. On Sept. 13, the city’s Development Review Committee will consider the proposal for PMG’s portion of the site. It calls for two apartment towers with a combined 1,214 units, 40,000 square feet of retail and 1,944 parking spaces. The apartment towers would rise 46 and 42 stories while the parking deck would be 13 stories. The 244,656 square feet of retail currently at the property would be demolished. Two major public transit projects, the Wave streetcar and the Brightline passenger train, are also under construction and will have stops near Las Olas Riverfront. One-bedroom units in Las Olas Riverfront would measure about 500 square feet while two-bedroom units would measure 800 to 900 square feet, Shear said. For projects like Las Olas Riverfront, being in the urban core could lower transportation costs and reduce transportation expenses. All across South Florida, car-dependent residents are being asked to embrace urban living. To see the full article please visit The South Florida Business Journal. Dania Pointe, an open air, mixed use center is on its way to the Fort Lauderdale area. This massive Dania Beach Real Estate development of shops, residences, offices and two hotels will be located within the city limits of Dania Beach. 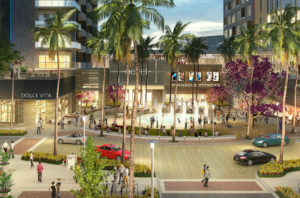 Dania Pointe will be considered a “lifestyle center” serving the Greater Fort Lauderdale area. The $800 million entertainment center will be constructed where the former 100 foot tall “Hurricane” wooden roller coaster once stood. Dania Pointe will be a comprehensive community comprised of national and local tenants including restaurants, retail, office, luxury rental apartments and condominiums. Two signature hotels are also planned to be built on site so you can work, play and stay all just minutes from Port Everglades, the Fort Lauderdale-Hollywood International airport and The Design Center of the Americas (DCOTA). Dania Pointe will be one of the largest shopping centers in Broward County and a great asset for Dania Beach real estate. Not everyone was excited to see the tallest roller coaster in Florida come down, but the small town of Dania Beach could use the boost to their economy, not to mention the surrounding cities. Class A office space is scarce in Eastern Broward County, so this should fill void for local businesses. The first phase of the development is scheduled to be completed towards the end of 2017. According to the Greater Fort Lauderdale MLS database there were just 349 condo/townhome or single family home sales in Dania Beach since January 1st, 2016. The median sales price was $165,000 and the average days on the market from listing to closing was 124 days. Maybe now is a good time to buy a home or commercial property in Dania Beach. Interested in buying some Dania Beach real estate? Search our website real time now. 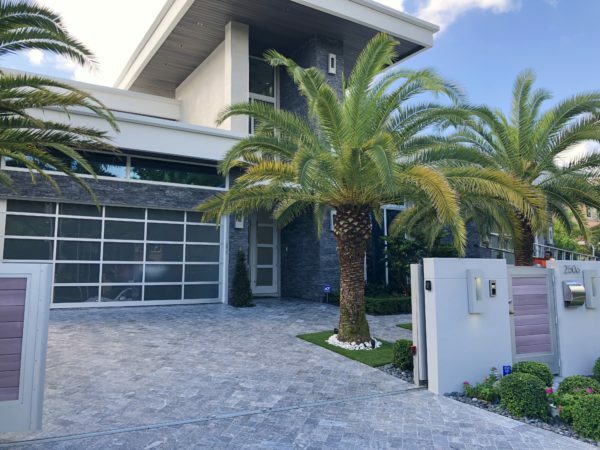 Fort Lauderdale Real Estate – Varabyeu Partners, an architecture and design firm with offices in Coral Gables and Minsk, has a growing list of projects and clients around the world. Verabyeu’s a man in demand. Varabyeu Partners has worked on the “Aqua” projects—AquaVue, AquaMar, AquaLuna, AquaVita, and AquaBlu—a series of smaller condominium projects centered mostly around the Las Olas Isles area. They’re also attached to other projects that haven’t begun yet—but that could continue the evolution of Fort Lauderdale real estate architecture and design. New ideas going into architecture and design in Fort Lauderdale have quickly become apparent. There’s historical precedent that still exists—from Francis Abreu’s 1920s Spanish-styled elegance to Dan Duckham’s deceptively straightforward mid-20th-century modernism, Fort Lauderdale’s architectural and design standards have benefited from serious talent over the decades. As downtown becomes a higher density—a real downtown—and as residents rethink what they want to have out of their experience, new styles and functions are being sought. Things are changing and into that space step people such as Varabyeu. For the full article please visit Fort Lauderdale Magazine. Wilton Manors Real Estate – On October 1st, 2016, the City of Wilton Manor’s residents—in single family homes—will have the option to have their household hazardous waste collected at their homes on the third Wednesday of each month. The new program, called “Waste Management’s At Your Door Special Collection,” will replace the City of Wilton Manors annual drop-off event—which was previously held in February of each year. Hazardous materials include products that are hard to recycle or cannot be disposed of in the regular trash. Such as garden/swimming pool chemicals, electronics, batteries, fluorescent lamps, motor oil, antifreeze, and more. For a full list of such items, you can visit the hazardous materials page on the City of Wilton Manors Website. 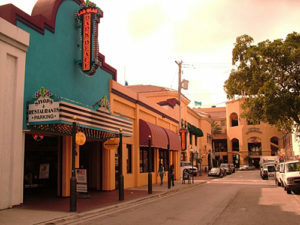 If you’d like more information about the Island City of Wilton Manors you can simply visit their homepage at www.wiltonmanors.com. please see some our more popular webpages. Pompano Beach real estate is on fire this year. New developments are popping up everywhere including residential condominiums, commercial developments and apartment rental buildings. What was a large, unused parking lot – at the Southeast corner of NE 4th Street and NE 20th Avenue – will now be the spot for the new Atlantic Towers. 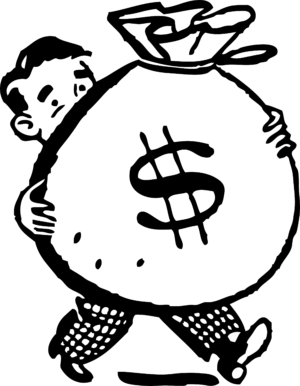 The property sold for $5 million to the developers from Pompano Atlantic LLC – an affiliate of the Meyers Group. Just off Federal Highway, the development of this eight story, 147 unit apartment complex was recently approved by the City of Pompano Beach. Designed by RLC Architects, the complex will total 163,438 square feet. Alan Losada, the COO of the Meyers Group, plans to break ground with the project in the beginning of 2017. Another proposed project is Broadstone Oceanside, which would have 211 apartments, 2,700 square feet of retail, a 432-space parking garage and 27 boat slips located at 1333 S. Ocean Blvd. The site is owned by WH Pompano, which is managed by Dev Motwani. He plans to create a joint venture with Phoenix-based apartment developer Alliance Residential. For more information on Broward County projects, please see the recent South Florida Business Journal’s article. In addition to this, four more large developments are on the agenda for Pompano Beach real estate at the beginning of the year. There is a hearing before the city’s Development Review Committee on January 20th to decide the logistics. One of the four is major New York developer and property owner – The Chetrit Group. They plan to build 108 multifamily units and 14 townhouses on a 4.3 acres along the Intracoastal Waterway near the Hillsboro Inlet. With three other projects on their way to be presented at the January hearing from other developers, Pompano Beach real estate seems to be well on its way to renovation and revival. “We think it’s an up-and-coming area.” Losada stated in an interview with South Florida Business Journal. “There’s a lot happening right now there on the beach with new construction and restaurants…U.S. 1 has seen a lot of improvements with new shopping centers and a new LA Fitness.” There has also been some successful new restaurants that have opened, such as The Foundry, across from Houston’s. All of the improvements and new development in Pompano Beach will help bring in more traffic to the local businesses and help strengthen the economy. This is very exciting news and is something that many Pompano Beach residents have been looking forward to for years. For the full article in the South Florida Business Journal, please see their website under Pompano Beach Real Estate development. For Pompano Beach real estate for sale, see some of our more popular pages.